HQ of London Underground described on opening as 'the cathedral of modernity'. Exterior features sculptures by eminent artists of the day, including Henry Moore, Jacob Epstein and Eric Gill. Most famous buildings are identified by their name, or by their occupants or purpose. It is rare, if not unique, for a building to be known principally by its postal address. 55 Broadway is one such property. Under its postal name, it is not only readily associated with "London Transport" but also enjoys a much wider architectural reputation. Yet the building – because of its location – is, undeservedly, relatively unknown, even to Londoners. The District Railway (one of the companies that was to form London Transport and, in time, London Underground) constructed London's second underground line in the late 1860s under the maze of Westminster's back streets between St James's Park and the then recently constructed Victoria Street. Both the new line and St James's Park station opened in 1868, and thirty years later the railway company transferred its offices from Victoria Street to new premises over the station. As the District Railway Company and its successors expanded their control over public transport operations in London, the offices were rebuilt and extended. By the late 1920s, the Board of what had become the Underground Group (that included the Tube railways, the London General bus company, various tram operators and electrical supply companies) was anxious to house all its staff in one new purpose-built block on the site. The Underground Group wanted its new headquarters to reflect its bold vision of the future for public transport in London. As well as 55 Broadway the late 1920s and 1930s were to see equally bold architectural statements in the Group's new Underground stations. In the 1920s it was still considered radical for a company to occupy its own premises rather than to rent accommodation. But the plans developed by Adams, Holden and Pearson, the architects commissioned by the Group, were even more radical: 55 would be the tallest office building in London; a cruciform design – in place of the more common hollow rectangle format – would offer staff more natural daylight working in the wings that projected from a central service core that houses lifts, staircases and other services; and Contemporary artists would be invited to sculpt decorative features directly onto the stone façade. The name of Charles Holden, one of the partners in the commissioned firm of architects, is always associated with 55 Broadway and the Underground Group, for whom he undertook many other commissions, notably new stations such as the Morden extensions of 1926, and the Piccadilly line extensions of 1932/33. For 55 Broadway, Holden adopted an ingenious solution for a site made complex by both its irregular shape and by the railway only 8m (24 feet) below ground level. Holden provided a route for pedestrians through the ground floor of the offfices and across the station booking hall, thereby reducing the circuitous walk between Victoria Steet and the Park. This "short cut" became the principal axis of Holden's cruciform design, although the purely cross-shaped layout for office accommodation was only adopted from the second floor upwards. On the ground and first floors, the "hypotenuse" of three of the triangles was additionally used as working or commercial space. 55 Broadway was constructed between 1927 and 1929. The building is supported by 700 concrete piles sunk to an average depth of 12m (40 feet) below basement level. Nineteen massive load-bearing steel girders span the railway, and special insulation was used to reduce vibration from the trains. Above ground, the building was constructed around a steel girder skeleton (supplied and constructed by Rubery, Owen of Darlaston, Staffordshire) and faced with 2,200 cubic metres (78,000 cubic feet) of high quality Portland stone. This was a material much used by Holden (although in later Underground buildings he would become famous for the use of reinforced concrete and brickwork) and much attention was taken as to the precise cutting and dressing of the stone so as to ensure subtle details would be enhanced and weathering would help develop the 'look' of the building. As well as Portland stone use was made of Norwegian granite for the plinth facings and black Belgian marble for the column capitals at low level. In addition there was extensive use of decorative bronze features throughout the building. The façades were embellished with decorative drawings, carved in-situ. Two are just above the street level – Night and Day by Jacob Epstein – and a further eight, representing the Four Winds, are above the sixth floor level on each side of all four wings. These are by Eric Gill (3), Henry Moore, A H Garrard, Eric Aumonier, Allan Wyon and F Rabinovitch. They are among the most celebrated public sculptures of the twentieth century and, indeed, the Epsteins provoked considerable outcry at the time of construction. The bold appearance of the building is enhanced by the progressive stepping back, and the central tower further echoes the uneven 'pyramid' effect. This design, above the eighth floor, was an answer to the "London Building Act" requirements – and the building was felt by many to be very 'American' in style. 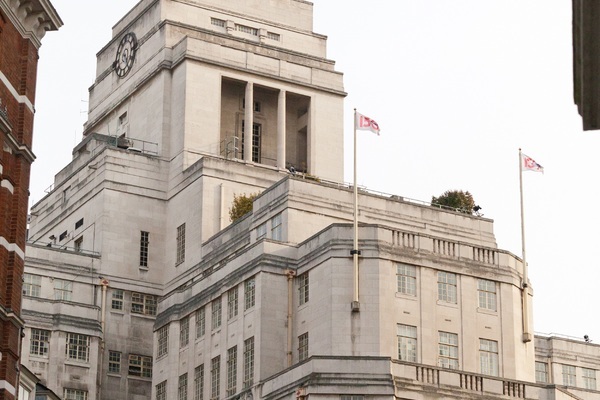 Adams, Holden and Pearson won the London Architectural Medal, awarded by the RIBA, for 55 Broadway in 1929 and Holden was to receive the RIBA Gold Medal in 1936. As well as his works for the Underground Holden was also architect for other, significant, buildings – including the Bristol Central Library (1902), the British Medical Association headquarters (now Zimbabwe House) on the Strand (1907) and Senate House for the University of London (1931). He also did much work for the Imperial War Graves Commission after the First World War. 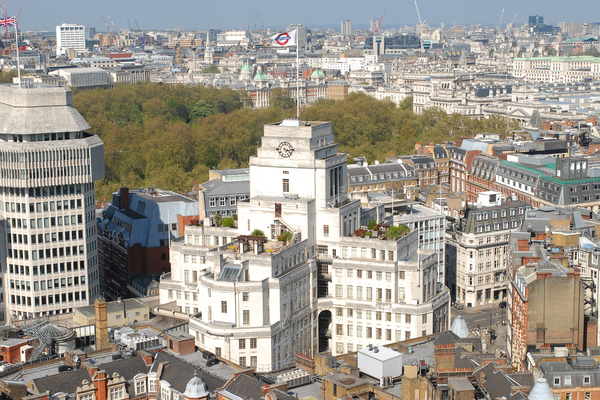 Now over eighty years old 55 Broadway still serves as the principal offices of London Underground. The building was directly hit during the Blitz in 1941 but carefully reconstructed in Portland stone after wartime brick repair. It has been extensively refurbished, most notably the ground floor alterations of the late-1980s by Manser and Partners. These broke public access to the principal north-south axis, and also created a small shopping arcade at ground level. This work was done to a high standard using much of the original material and design features. The major services have also been renewed – one feature that had become troublesome was the underfloor heating and this was removed and replaced by more conventional systems in 1986/87. - The tenth floor gardens and meeting room, the latter once forming the "Executive Officers Dining Room"
55 Broadway is a Listed Building at Grade 2, although this is currently under review by English Heritage. It remains one of London's most significant commercial buildings – still the administrative hub of the Underground system that serves the city, its inhabitants and visitors.